In March 2016, I was fortunate enough to place 1st in the #solocontest2106 put on by Mayones Guitars, Line 6, Mesa Boogie, Gruvgear, Toontrack, and John Browne of the band Monuments. In winning this contest I received John Browne’s signature guitar, the Mayones Duvell Qatsi. Yeah, she’s gorgeous. Now that you’ve seen it, let’s hear it! This guitar comes in two finishes, Purple burst quilt top and a Juice burst quilt top (which incorporates different shades of green, highlighted in neon green on the border). I’m usually not a fan of neon colors but this guitar is absolutely stunning in person. I was extremely surprised and pleased by the look of the top and have fallen in love with it. In conjunction with the natural wood on the neck and back of the body it’s just beautiful. As if that really matters though, right!? Besides looking great it is one of the nicest (if not THE nicest) playing guitars I’ve ever touched. Playability is basically flawless. The neck has a nice thin profile with a 16-inch radius on the fretboard. It feels great and has a very nice tung oil finish on the back, which allows your thumb to move freely without sticking. The Shaller Hannes bridge in combination with the Hipshot tuners are just amazing. This guitar stays in tunes for days and the intonation is killer, not to mention the bridge is one of the most comfortable bridges I’ve rested my right hand on. These guitars run at about $4500 – $5000 USD and it is obvious why when you pick it up and play it. The craftsmanship is incredible! Also, when playing this particular axe, it’s obvious that it’s a metal machine. Besides looking that way, the Bare Knuckle pickups also cater to the modern metal sounds that John would use in Monuments. I wouldn’t necessarily bring this particular guitar to a non-metal/non-hard rock gig, but that’s okay because Mayones has plenty of other models that can hang in those situations. 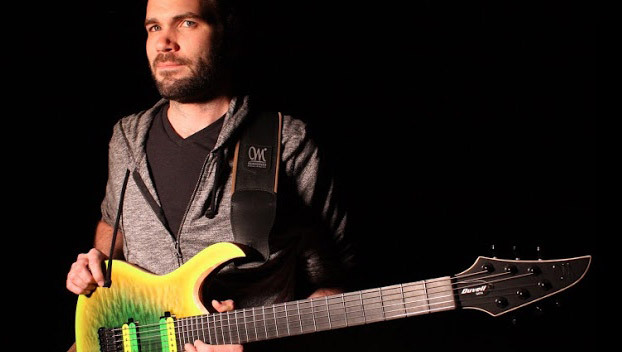 This guitar was made for metal and it does the job very, very well. Do you own a Mayones guitar? Or do you have a particular model on your wish list? Let us know in the comments below!